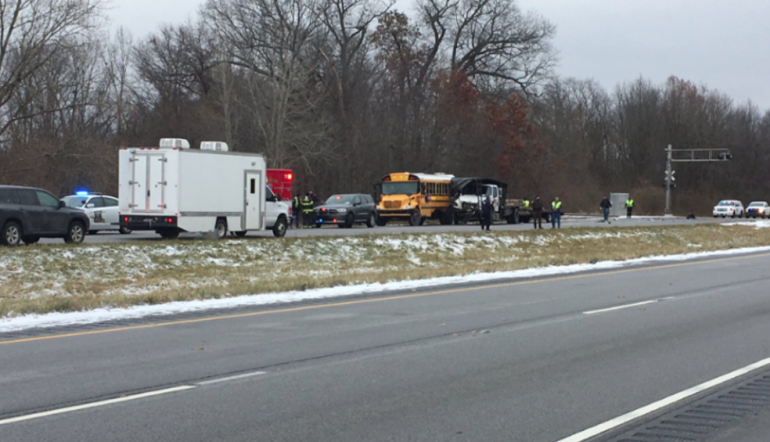 (MARSHALL CO.) - One student died in the school bus crash, police tell WSBT. Police say the student who died is a teenage boy. An East Pulaski school bus was involved in a crash with a semi-truck on US-31 between Argos and Plymouth. According to police, a flatbed truck rear-ended the bus. One child was airlifted to a hospital in South Bend with what police believe are non-life-threatening injuries. The other children were taken to St Joseph Hospital in Marshall County to be reunited with their parents. Police confirm that there were 38 students on the bus, as well as three chaperones and a bus driver. The crash happened next to a railroad crossing. School buses are required by law to stop at all railroad crossings. They're still investigating what the driver of the flatbed was doing before the crash.